A beautiful soft 16" pink teddy bear ready to hug and hold. 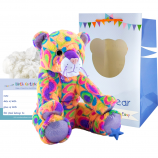 This kit contains Princess 16" bear skin, super-soft stuffing, star charm, birth certificate, party invitation and deluxe carry bag. 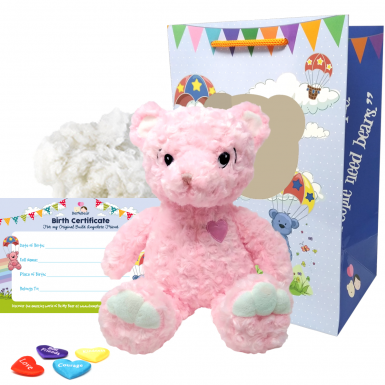 Our Princess is a pink plush bear with white paws and beautiful dark eyes and a large loving smile. 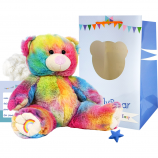 Princess Bear is a member of the sixteen inch range of build anywhere bears from Be My Bear. 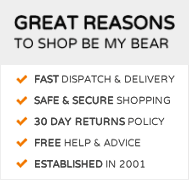 Princess originates from Alaska in the USA and is a Queen Charlotte black bear (quite fitting as she is a princess)! The Queen Charlotte bear has a varied diet which includes crabs, clams and mussels, in the spring and early summer they enjoy fresh green vegetation and from June berries play an important role too. In October when the salmon start to spawn, Queen Charlotte bears love nothing more than to catch leaping salmon from the streams around Alaska. Princess is suitable for children aged three and over and is the ideal gift for special occasions and teddy bear making birthday parties. 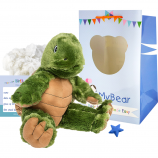 As with all of Be My Bear's teddy bear and stuffed animal making kits you will receive your Princess skin with one-way zip closure, a bag of soft and fluffy stuffing, our satin make-a-wish star charm to bring Princess Bear to life, a birth certificate, party invitations and instructions. 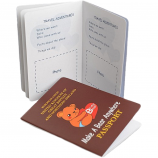 To complete the package we also include a luxury gift bag so Princess can be carried around in style.